You can travel for months at a time, if you only take what you really need. You can travel with only one bag, which you carry on, instead of checking it. It’s an intriguing and liberating thought: to be able to travel without checking a bag (for which most airlines now charge extra), skipping the check-in line on departure and the baggage carousel on arrival, unconcerned about the security of your bag when it’s out of your possession. It sounds awfully appealing. But I knew my old Eagle Creek bag, with its wheels, badly-designed handle, and never-used hidden backpack straps, wasn’t a bag that I could carry into one-bag-carry-on-Nirvana. Fortunately, Doug Dyment, the keeper of onebag.com, has teamed up with a small US-based bag manufacturer to develop what he believes to be the ideal business traveler’s bag: the Air Boss. Red Oxx is a luggage manufacturer based in Billings Montana. Their products are only sold on-line and at their factory store. Every piece has a “no bull” lifetime warranty that they’ll probably never have to fulfill, because their bags are build to last forever. #10 YKK zippers, double-stitched seams, box-stitched handle stress points, and Fair Trade produced monkey’s fist zipper pulls. The Air Boss is boxy. which means that it utilizes every square inch of the allowable overhead compartment space. The two side compartments open flat for easy packing, and have internal tie-downs to help compress your clothing. The center compartment is the right size to slip in a laptop or briefcase, if you’re traveling with one. Also worthy of notice is the shoulder strap, called “the Claw.” This is the key to life without wheels. The Claw has a 1/4 inch molded-on super-grippy rubber pad at it’s center. An NFL linebacker couldn’t knock this thing off your shoulder. It’s comfortable and superbly functional. I’m on my first trip with the Air Boss, and it’s performed beautifully so far. 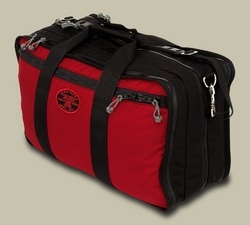 In a future post, I’ll write about the Red Oxx Gator Carry-on that I picked up to transport my CPAP machine. It’s still in transit. Like me.